Because of Henry Wadsworth Longfellow’s famous poem, “Paul Revere’s Ride,” most people think that Revere was critical to the start of the Revolutionary War. In trying to dispel Longfellow’s myth of a lone hero, modern scholars have portrayed Revere as just one rider among dozens on 18-19 April 1775, and argued that his previous rides for the Patriot cause might have been more important. 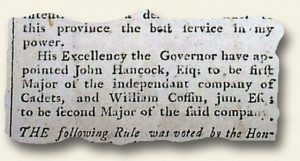 A survey of newspapers from 1774 and 1775 shows that in fact those earlier rides had made Revere prominent enough that he did stand out in reports of the fighting at Lexington and Concord, even as Massachusetts authorities kept the extent of his activities quiet. It was such a tragedy to America when Alexander Hamilton, the founding father of the United States, chief of staff to Washington in the Revolutionary War, and America’s first Secretary of the Treasury, was killed in a duel, an event he opposed but honor forced him to participate. 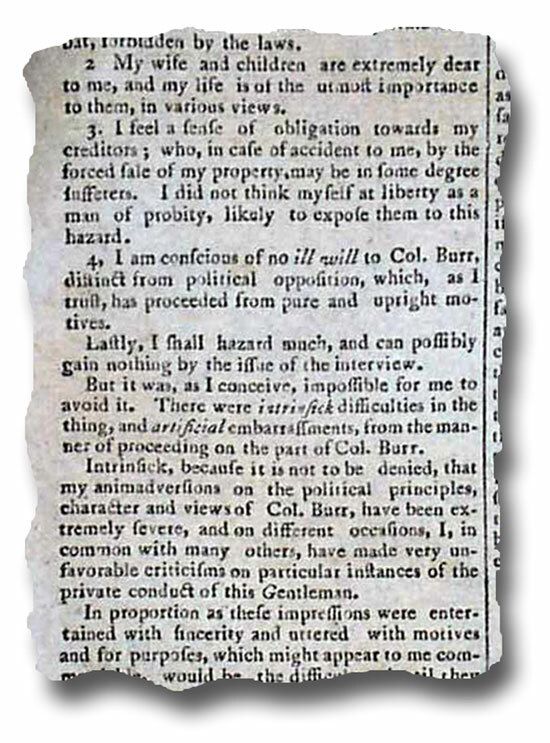 His words from shortly before the duel are telling: ““My religion and moral principles are strongly opposed to the practice of dueling…My wife & children are extremely dear to me…I am conscious of no ill will to Col. Burr distinct from political opposition…But it was, as I conceive, impossible for me to avoid it…”. 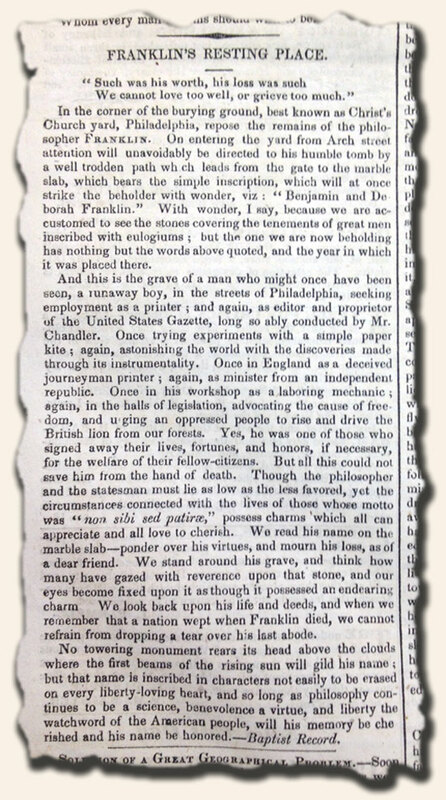 The report is found in the “Middlesex Gazette” newspaper of July 20, 1804 (see below). His wounds at the hand of Aaron Burr–who curiously was Vice President at the time–would prove fatal. His comments give evidence to the value of honor among the early patriots, even when they lead to a tragic end. Continuing with our discussion on the “most historic” reports to be found in newspapers, we have been discussing the events of American history by era, the last being the 1801-1860 era. This post will discuss the most significant event in American history of the post-Revolutionary War, 18th century era from 1784 thru 1800. Much happened in American history during this brief 17 year period but I’m not so sure there are many events which qualify as the “most historic”. From 1784 to 1787 much effort was made to organize the loosely attached colonies into a cohesive whole (see Articles of Confederation as an example), which ultimately led to the Constitutional Convention and the resultant Constitution which remains to this day. Through the ratification process it was evident that more rights needed to be clarified, resulting in the Bill of Rights of 1789. During this same year the first presidential election happened and the federal government was established, and in subsequent years a permanent site was created for the federal government, the Native Americans’ concerns were dealt with as the nation crew beyond the original 13 states, The Whiskey Rebellion challenged the collection of federal taxes, Jay’s Treaty with England was consummated, and growing troubles with France & other nations put greater focus on formalizing a federal military. All these events and more played a role in molding America during these critical formative years. But the most historic? My vote has to go with the creation of the Constitution. And a newspaper with the printing of this document would be a very prized addition to any collection.